Since TeleForm Version 2 in 1994, Digital Vision has brought successful electronic forms processing to hundreds of customers. General: Toolbars and themes conform to current Windows os. Toolbars are easily customizable. Automatic Backup of TeleForm Templates and Settings: A snapshot of TeleForm system settings and templates can now automatically be generated at specified time intervals. Designer. New tabbed layout puts each open form template in a separate tab, allowing easy switching between open forms. The Fields tree list control can now be pinned to always stay visible, or can be unpinned so it auto-hides when not being used..
New toolbar controls jumping to a specific form page . Verifier. New tabbed view puts each image in a tab for easy access when opening images . OCR and Barcode. OCR and Barcode engines have been updated to address issues identified including TF-7843, TF-7806, TF-7240, TF-7093, TF-6404, TF-7602 and TF-6762. l.
Automatic Batch Creation. In addition to defining the number of images required prior to automatic batch creation, a user can now also set the maximum number of images that can be processed in any given batch. TeleForm Enterprise - a full-featured solution designed for use by multiple departments within large, distributed enterprises. This scalable, network solution is capable of meeting the most demanding business requirements. TeleForm Workgroup - a multi-user departmental system designed to meet the needs of high-volume capture projects. Teleform Desktop - a single-user departmental workstation solution designed to meet the needs of project oriented environments. Liquid Office is the automation and coordination of the countless forms, documents and tasks that make up your business processes. LO coordinates people and information technology assets both inside your business and in your network of customers and partners. eForms replace manual paper processes with online forms and documents. Liquid OFfice (LO) is a powerful Web-based eForm automation solution solution that enables automation of both document and eForm processes: workflow, business rules, approvals, webservices, Business Activity Monitoring (BAM), and document processing. LO is the easiest way for put forms online and automate the mission critical processes they drive. Business and IT professionals can visually assemble end-to-end workflows significantly reducing the cost, time, and risk of streamlining, integrating, and securing document and form based processes. Vector/font-based PDF files can now be processed without customer installation and configuration of external tools such as GhostScript. Provides out-of-the-box support for rendering non-image PDF files so they can be processed by TeleForm just like image files. TeleForm Mobile Web Capture extends the TeleForm Web Capture feature with an HTML5 based web application optimized for mobile devices. Mobile Web Capture allows users to capture images (e.g. photographs of paper documents) and submit them as a batch to TeleForm using a smart phone or tablet. The user can select a TeleForm Job Template and enter related data into the batch fields. XML, HTML, PDF — APA streamlines the creation, routing, tracking, approval and signing of online eForms. 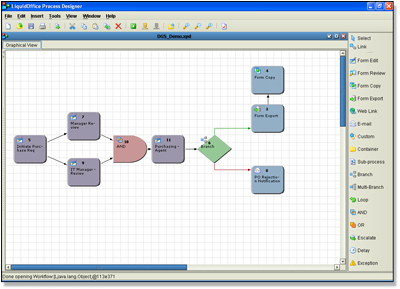 XML-based business process automation solution generates database queries for real-time personalization and validation. It routes forms to the appropriate department and notifies managers by email when digital approvals are needed. This results in efficient and secure electronic processing of enterprise information. By adhering to open standards, LO promises to be the last migration you will have to make. The LO eForm Management System is a dramatic technology shift in the eForms market segment, for the first time leveraging industry standard technologies such as HTML, PDF, Java 2 Platform, Enterprise Edition (J2EE), the eXtensible Markup Language (XML), and web services. The result is a highly-scalable solution that can integrate with any IT infrastructure. Process Automation eForms provides an intuitive drag-and-drop interface to speed the creation of new forms and the import of existing forms. An optional form conversion tool for PA eForms quickly converts nearly all online formats into PA. Supported formats include static PDF, PageMaker®, Quark, Microsoft® Word and others. This ease of use also extends to implementing advanced features such as data exports, dynamic pull-down lists, auto-fill, fill-from-profile and digital signatures. Consistently among the highest rated products, HP Autonomy Process Automation is very competitively priced with a low cost of ownership.